Moving is stressful, moving during the winter months, next level. There are plenty of factors to consider when moving during the winter, but first let us consider the positive ones. Moving in the off season can lead to cheaper rates and more flexible scheduling, sounds good to me. Now the obstacles, the obvious is the unforeseen weather for the day of the move. 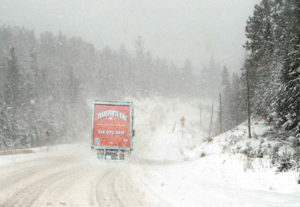 Harsh temperature or snow fall can lead to longer move times, with no one to blame but the weather. Consider these helpful tips when booking a winter move! Clear the pathways and driveways: Before the movers arrive, shovel and salt the driveway, slipping leads to injured people and damaged goods. No liquids: Liquids can freeze in the cold, the longer the move the better chance of the liquids freezing. We recommend that no liquids for any moves longer than 8 hours. Remember to drain your appliances of liquids- washing machines, dishwashers and fridges. Some furniture does not like the cold: Black lacquer furniture cannot handle freezing temperature, it peels. During a move, it should be the last thing on the truck and first thing off. Daylight: Consider the time of day for the move and the natural light, winter months mean shorter days. Schedule the move with daylight in mind. Do not pack winter supplies that you will need the day of the move such as snow scrappers, hats and mittens. You get the idea and make sure that your car is cleaned and ready to go so you can meet the movers at the destination as quickly as possible. Before you know it, your move will be done and you were able to survive a winter move!